There are several settings that you can change for your user account. You can access these settings by selecting Profile (top right) from within the portal. This article covers those settings. You can change your First and Last Name, Timezone, Email address(es), Directory Options, Area Code, and voicemail/portal password. You can change your First and Last Name as shown on internal calls, and as listed in the company directory. 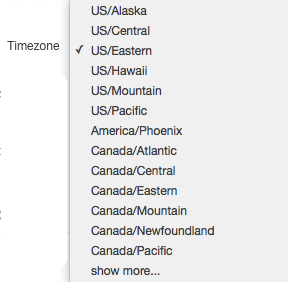 You may change the Timezone for your extension. This will update the time displayed on your phone, as well as display the correct time on voicemail messages and call history. You can set your email address in this section. This allows you to receive voicemail to email, as well as additional features we will be rolling out soon. You may also set multiple email addresses if you would like for voicemails to go to multiple email boxes. To add additional email addresses (up to 5 total), click on the green plus icon next to the email field. To remove an additional email address field, click on the red X icon next to the email field. Directory Options allow you to determine how your extension is displayed in both the corporate directory (dial by name) and in the Contacts pop-out within the User Portal. Announce in Audio Directory: This option allows your name to be available in the Corporate (dial by name) directory. List in Directory: This allows your user to be listed in the Contacts pop-out within the User Portal. The CallerID information is mostly read-only, except for the Area Code field. The Area Code field affects 7-digit dialing. This is the area code that is prepended to all 7-digit calls to make them 10 digits. This usually matches your CallerID Area Code. The Caller ID and 911 Caller ID fields are read-only, showing you what is sent when you make a call or an emergency call. 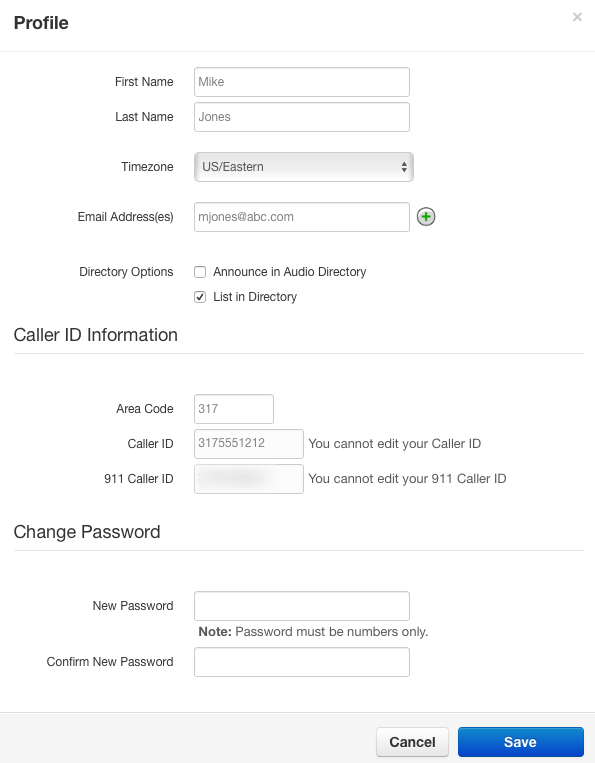 The Change Password section allows you to change your own voicemail and portal password. The password must be numerical, must be at least 6 digits, and cannot contain your extension number.